The ingredient that can help get rid of dark circles from the inside out. Raise your hand if you’ve ever felt personally victimized by dark circles. (Yeah, us too.) One of the most common culprits of dark circles is, surprisingly, your liver. When it gets backed up with toxins, it takes it out on your under eyes. That’s where milk thistle comes in. It can help wipe out liver-related dark circles better than your favorite concealer since it helps detoxify your liver. Keep reading to see how. Your liver is located on the upper-right side of your abdomen. Blood coming from your digestive system passes through the liver carrying nutrients (like protein, fat, and carbs), medication, and alcohol. These substances get processed and filtered in the liver, then either return to your bloodstream or go to your bowels. Your liver also helps break down fats, protein, and carbs and turns them into energy. Your liver is also the only organ in your body that can regenerate damaged areas with new cells rather than scar tissue. Sometimes, your liver needs a little help—especially if you’ve been drinking alcohol or overindulging on sugary, fatty, processed foods. So what does this have to do with your under-eye circles? When your liver isn’t functioning at its optimal level, it can manifest as dark circles beneath your eyes. Milk thistle is a rather pretty herb. Its extract, also called silymarin, is aids the liver in the detoxification process. It’s been used for over 2,000 years to support the liver and gallbladder. How Does It Help Your Liver? Milk thistle benefits include detoxification, antioxidant support, and liver support. Research suggests that silymarin can be beneficial in supporting the liver because it promotes regeneration of cells that have been damaged by the environment, stress, and alcohol. It also decreases inflammation. Next, according to the University of Maryland Medical Center, there is evidence that milk thistle may help the liver in its regeneration process by growing new cells. It’s also a powerful antioxidant that helps prevent free-radical damage. A healthy liver flushes out unwanted toxins that may otherwise go to your skin and can cause dark circles. 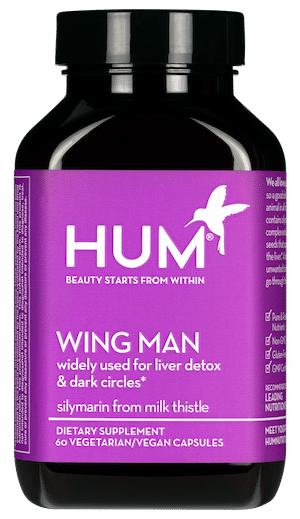 You can find milk thistle, along with detoxing dandelion root and toxin-flushing artichoke, in our WING MAN supplement. Is Aspartame Putting Your Diet In Danger?